Bulgarian exegete and poet; lived in the second half of the fifteenth century, probably first at Widdin, and later at Constantinople. He maintained a correspondence on scientific subjects with Moses Capsali, Elijah Mizraḥi, and other Talmudical authorities. Joseph Colon mentions him as having lived at Constantinople (Responsa, No. 83). 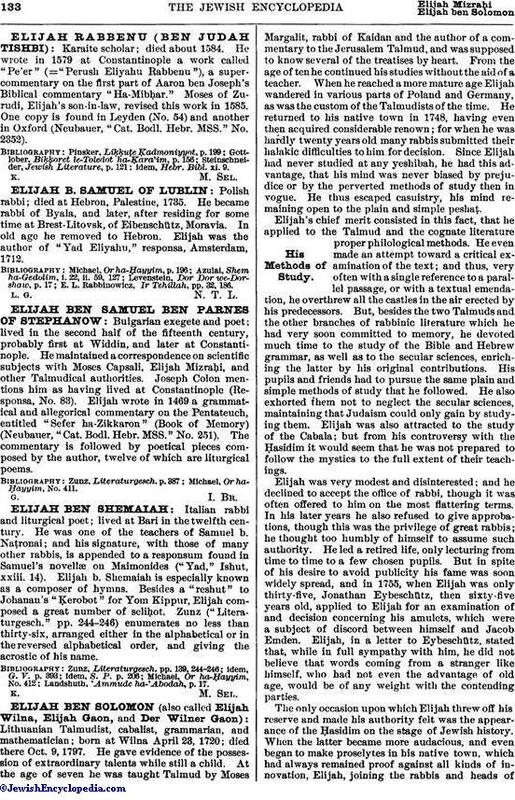 Elijah wrote in 1469 a grammatical and allegorical commentary on the Pentateuch, entitled "Sefer ha-Zikkaron" (Book of Memory) (Neubauer, "Cat. Bodl. Hebr. MSS." No. 251). The commentary is followed by poetical pieces composed by the author, twelve of which are liturgical poems. Michael, Or ha-Ḥayyim, No. 411.